Similarly, Bee Venom is also a wonderdrug. More specifically Bee Venom Therapy is the therapeutic application of honeybee venom, through live bee stings and topical creams, which bring relief and healing for various spinal, neural, joint, or musculo-skeletal ailments. From circulation issues and high blood pressure to arthritis and rheumatism, bee venom stimulates the adrenal glands to produce cortisol, a natural human hormone that has anti-inflammatory properties. In addition, Bee venom jump starts the immune system to produce a healing response through the pituitary, and adrenal glands, and activates the production of endorphins, the body’s natural pain killer. I recently read a book by Fred Malone titled “Bees don’t get Arthritis”, where after a road trip across the United States interviewing as many beekeepers as possible the author concluded that the low percentage of beekeepers facing chronic health issues can be attributed to their frequent ingestion of bee venom. He also notes the overall vitality and longevity of beekeepers in general and directly correlates it to the commonness of sting on the job. Just as in all bee products, allergic reactions are possible with the treatment of bee venom and therefor its important to take precaution in their administration. If further interested in Bee Venom Therapy, seek out your local apitherapist for a consultation! Collected from the saps excreted from budding trees and shrubs, Propolis is pasty dark colored resin collected by the Bees and used in the hive to close off openings and keep all outsiders out. Mixed with saliva and nectar to achieve its malleable consistency it’s one of natures most complete antibiotics and is used as the beehives’ natural immune system. Bees also coat the entrance of their hive with this sappy substance to clean and disinfect them when they enter. Studies have even shown that the immune system of an individual honey bee is reflective of the amount of propolis within the hive. They even use it to coat, cover and eventually kill off through suffocation uninvited guests such as beetles and mice. It truly is amazing stuff. Scraped from the hive or collected by humans through the installation and scrapping of a gaped false roof placed on top of the beehive, propolis is a complex natural mixture of compounds which together offer a range of therapeutic benefits. Since the beginning of human kind, propolis has been used in its raw form for the treatment of deep burns and wounds in order to keep infections out and to aid in healing. A small portion of the sticky sap like matter can also be kept in the mouth to ease the symptoms of a sore throat. Its antibacterial qualities have also been shown to help in cases of oral health. Its direct application helps in the healing of canker sores, while the application in paste like form helps to regenerate healthy tissue in cases of gingivitis. It’s anti fungal properties also help in cases of chronic bad breath. Propolis tinctures, where the resin has been diluted and distilled in alcohol, is also used to promote heart health and strengthen the immune system. Not bad right? Humans have been using honey as medicine for thousands of years. Its good for just about everything. It’s calming qualities help to soothes coughs and throat irritations, its’ curative qualities help to regenerate skin growth for wounds and burns, and its’ absorptive qualities kill off bacteria in skin outbreaks and infections. It is a readily available and compact form of complex carbohydrates, ideal for circumstances of malnutrition as well as for athletes. Because it is already broken down by the bees, in the process of making it, honey helps with digestion as well as to stimulate the appetite. It truly can be considered nature’s miracle drug. It is also important to keep in mind how much bees work to generate this stuff. Bees fly over 55,000 miles visiting 2 million flowers to produce 1 pound of honey. That’s equivalent to flying around the world 4 times. They of course, do this for themselves. Upon completing all other roles, within the hive, the honey bee takes on the role of a forager and leaves the hives in pursuit of the life giving nectar produced by nearby flowers. 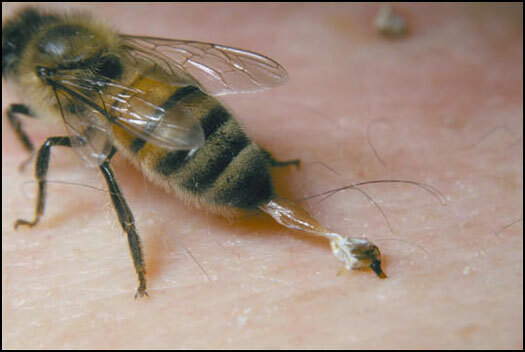 Honey bees will fly up to 6 miles from the hive in order to fill their mouths with this sweet life giving substance. Once they return to the hive, the forager passes the nectar off to a receiving bee by way of a kiss. Through this transaction the flower nectar is mixed with stomach enzymes and begins to breakdown and condense into the final honey state. The receiving bee then makes it’s way through the hive before regurgitating the nectar enzyme mix into previously built honey cells where it will further condense. Once that cell is filled by at least 9 foraging trips and the remaining moisture content is reduced below 18% , it is capped off by a thin layer of wax, (yes, produced by bees as well) where it will be stored indefinitely until future use. They do of course have a reason. All this work provides them with the food and nutrients they need to pass through flowerless winters. Knowing how much energy Bees put into producing this commodity, its important and even advantageous to keep in mind its value when consuming and applying.